Protecting the health of your employees is one of the most effective ways to improve their productivity. In Amherst, NY, the best way to protect the health of employees is by procuring the mobile health services offered by Healthworks Western New York. What Type of Health Services Are Offered? Healthworks Western New York offers a wide selection of comprehensive health services. Our most demanded service by Western New York employers is health screenings that include audiograms and hearing tests. We provide your employees with fast, on-site basic physicals and provide detailed reports quickly. Fast results allow for pre-emptive solutions to health problems that could potentially interfere with productivity. Another popular service is drug and alcohol testing. We understand it is important to ensure that employees aren't using substances that will create a risk while they are at work. Our testing is fast and non-invasive. Finally, we offer preventative health services which include immunizations, boosters, and clinics on how to live healthier lives. Research shows that preventative medicine results in major savings in health costs and decreases loss of productivity from sick employees. 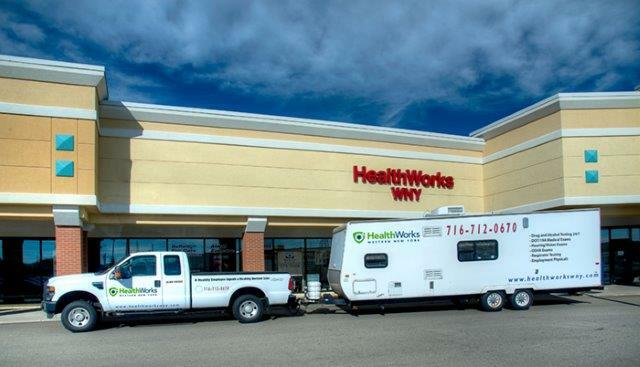 The best thing about Healthworks Western New York is that all of our health services are offered on-site. We have a mobile health facility that is fully equipped for every type of test and service that we offer. Our team arrives at your site at a time specified by you in order to provide health services and testing for your employees. We offer 24 hour service, allowing your 2nd and 3rd shift employees to get our health services without having to disrupt their usual schedule. Poor health is one of the leading causes of lost productivity in this country. If you run a business in Amherst, NY, it is important that you protect the health and well being of your employees. For the most convenient and least expensive health services, contact Healthworks Western New York today. Our team will schedule onsite health services at your place of business at a time that is most convenient for your schedule.